I am not one to fuss a lot over my feet. I don’t ever indulge in pedicures or foot massages. A quick scrub and a lick of nail polish on my toenails is all the tlc my feet get, and that too on a good day. But even tired Mummy-feet need to look sassy sometimes. Not because we have to be somewhere or do something, but because we feel like it. Oh, yes. Us frumpy mums have our glam days too, when we transform into our Yummy selves. And we often need a glamorous pair of heels to complete the look. Stilettos don’t really do it for me. The occasional move to a 6 inch tapering heel and the resultant shift in my centre of gravity is far too much for this mum-bod to handle. Flats and kitten heels are more my style. In case you hadn’t guessed, they are perfect for day-to-day mummy jobs. I do however, have a thing for wedge heels. Especially when they are as comfortable as the ones made by Hotter Shoes. I had a pair off them before, and now am the proud owner of these delightful new Breeze wedges. 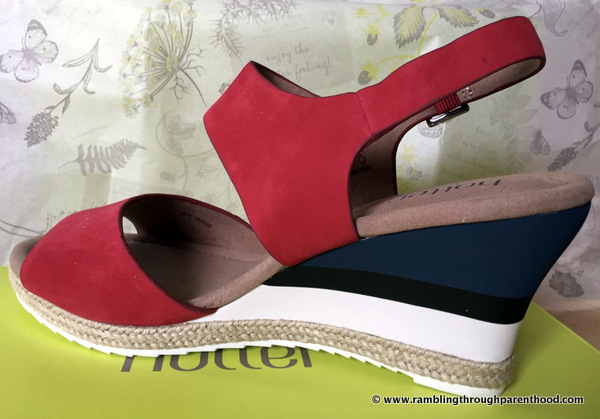 Comfort is paramount when I choose footwear and the Breeze wedges are no exception. 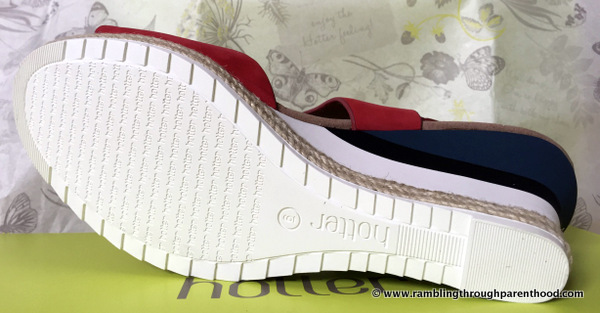 The shoe body is in supersoft nubuck leather and the cushioning underfoot is deep and sumptuous, so that my feet are cocooned in luxury and feel wonderful. 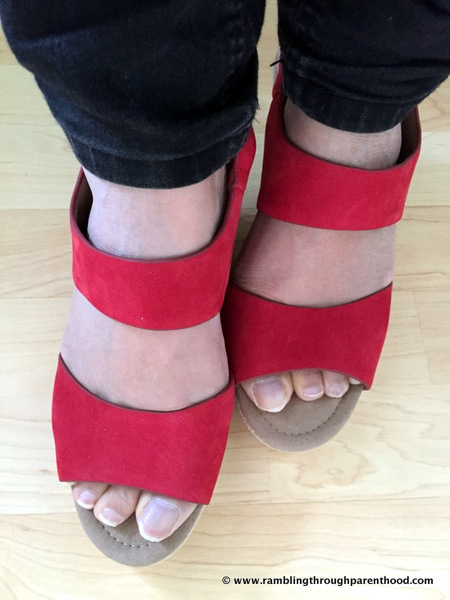 The 2 ¾ inch heel size is perfect to elongate my short, stumpy legs whether I am in a pair of jeans or a dress. The stunning bold colours can glam up even my sad, dry feet. How can they look anything but gorgeous in a deep cherry red! Do note the design detail. It is this that makes a Hotter Shoe stand out for me. 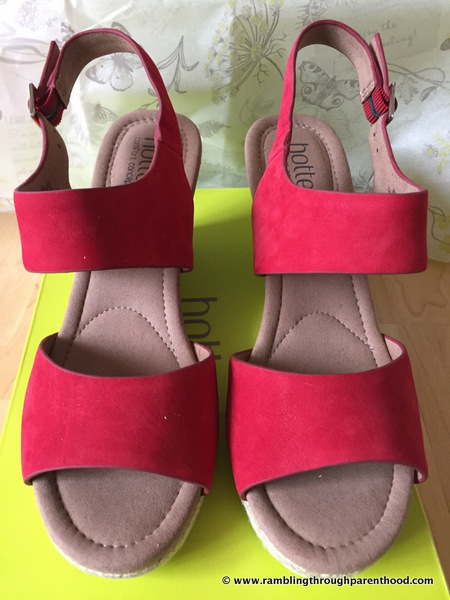 The contrast colour bands on the wedge heels and the fabric braid running around the bottom edge of the shoes add to the style. The saw-toothed sole on the Breeze wedges offers a good grip, so important when I am strutting about trying to be all sassy. Last thing I need is to slip and fall and make a spectacle. I manage that quite well as it is without the need to land awkwardly on my behind. 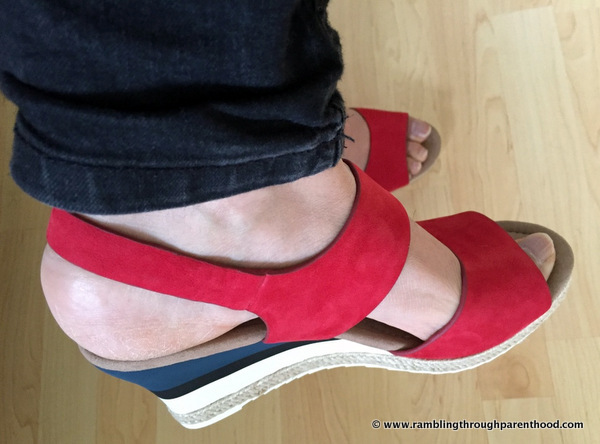 I am a shoe-size 6, and these wedges fit true to size. They have a secure buckle strap fastening and are a standard width. I have broad feet, and they still fit nicely. 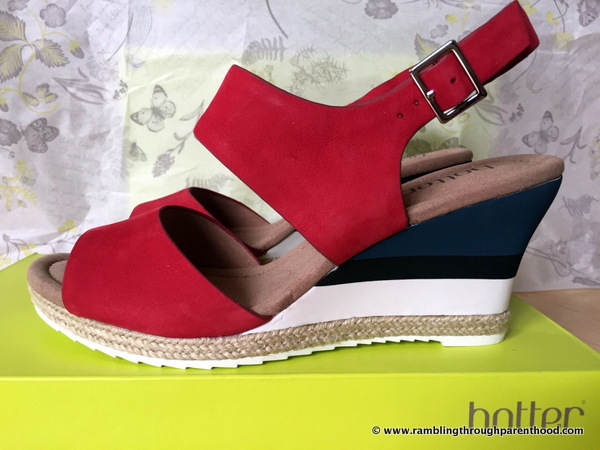 I am so looking forward to the warmer months when I can be out and about in my new Breeze wedges, my feet looking all pretty and glam. 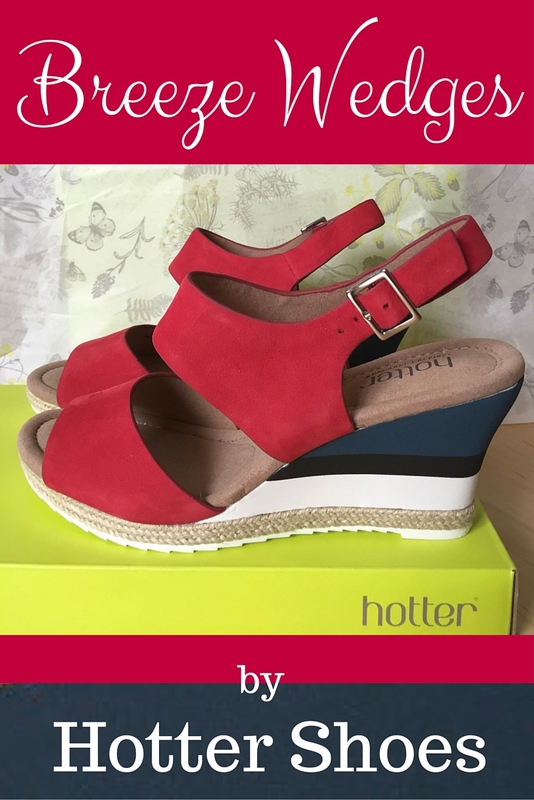 Disclosure: I was given a pair of Breeze wedges by Hotter Shoes for the purpose of this review. All opinions are my own. Ah, I've always loved Hotter shoes. In fact all my pairs have been pretty colours. Perhaps you can give them another try? They lovely, I really like the colour. they look like they have a comfort sole on them as well which is always important for us mums who are constantly on our feet! They really are super comfy. The Soft cushioning really helps. Wow aren't Hotter getting trendy? My 5yo walked past when these were on the screen and declared them to be nice shoes. Praise indeed! That is high praise indeed :-D Their latest collection looks incredible, if you haven't seen it already. They do these in other colours, but that bright cherry red just had me! I am all about the comfy these days, so Hotter shoes are fab for that without being too frumpy with it! Me too! I could never too stilettos, and comfort is always paramount. So these are perfect. I love the look of these very summery. I don't normally wear heels but when I do I prefer wedges. Same here, Joanna. I can't wait for warmer weather to get more out of them. Have you tried ordering them online, Kara? Or is your local store can get them for you? Me too, Kaz! They are great quality and fantastic value for money.